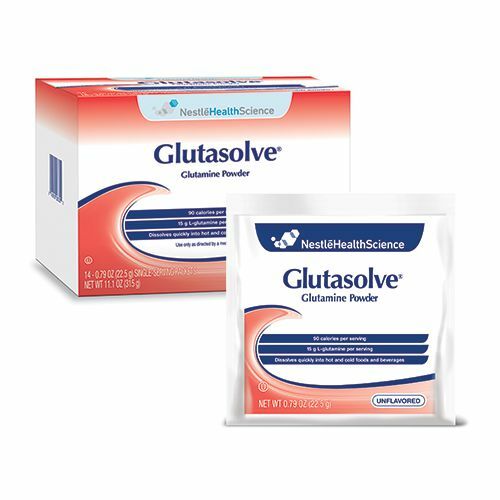 The Nestle Glutasolve Unflavored Powdered Food 22.5gm Packet Case of 56, Model #28330000, is anchored in advanced science and research. Nestle Healthcare Nutrition offers nutritional solutions for people with specific dietary needs related to illness, disease states or the special challenges of different life stages. Primary fuel source for cells of the GI mucosa and cells of the immune system such as lymphocytes. The addition of enteral glutamine is supported by the Critical Care Nutrition Guidelines for consideration in burn, trauma and mixed ICU patients. The use of supplemental parenteral and enteral glutamine is not recommended for critically ill patients with multi-organ failure. HIV / AIDS on HAART (Highly Active Antiretroviral Therapy). *Contains the amino acid L-glutamine. A single amino acid is not considered a protein.